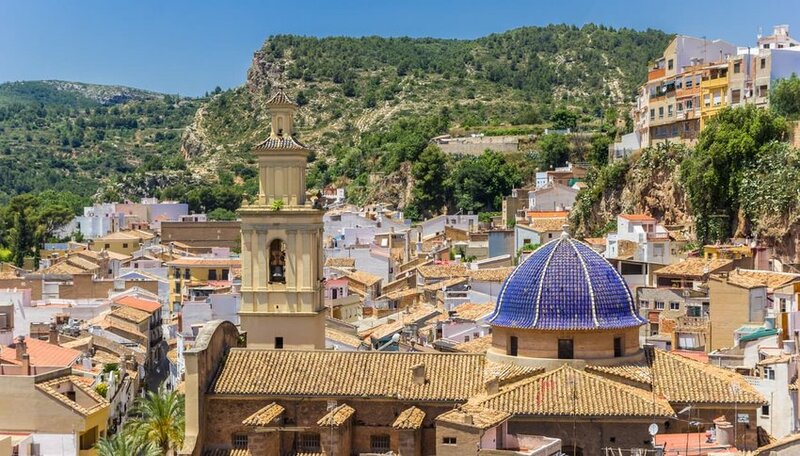 It’s never a good idea to venture out in the Valencian town of Buñol in your very best clothes – at least not on the last Wednesday of August. That’s the date they reserve for the most famous food fight in all of Spain, La Tomatina. In previous years, the crowds have numbered around 45,000 and though the event’s now ticketed for health and safety reasons, the town’s 9,618-strong population still swells by 20,000 each year. La Tomatina has its critics, particularly those who argue the (mostly rotten) tomatoes which give the festival its name should be used as food and not as ammunition. But never mind all that: how did La Tomatina start – and why? Let me take you back. 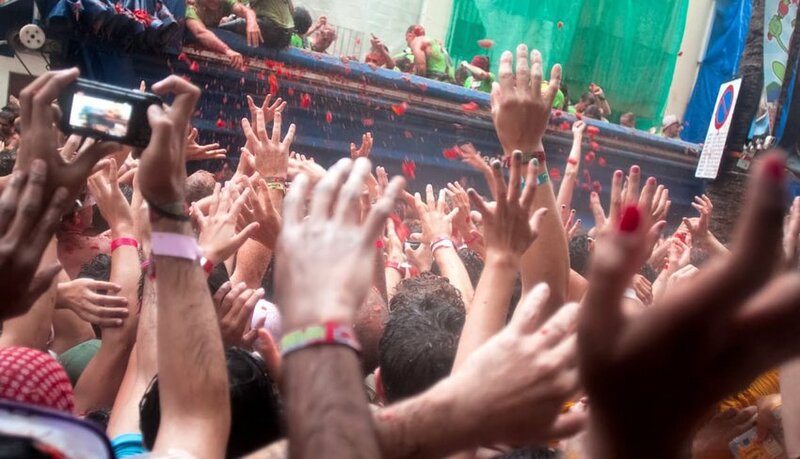 Unlike many festivals in Spain, La Tomatina’s not an ancient tradition. It’s thought that the first tomatoes were thrown in perhaps 1944 or 1945. There are several stories accounting for that first act of rebellion. The most commonly repeated suggests that a group of youngsters was attending another festival in Buñol’s main square. There was music, dancing and costumed figures known locally as igantes y cabezudos. Literally translated as “giants and big heads” these caricatures with oversized paper maché heads are seen all over Spain and Portugal. So the story goes, as a result of their overenthusiastic jostling, one of the figures fell. (In other versions of the story, it was a musician who fell from a stage where he was performing. No matter: the end result was the same.) Not surprisingly, the fallen figure was pretty angry and started to lash out, thumping everyone and everything within reach. It soon turned into a mass brawl and the participants looked around them for anything that could be repurposed as a makeshift missile. Luckily or unluckily, depending on your perspective, a fruit and vegetable cart just so happened to stand nearby, and the soft tomatoes were just too much to resist. Order was soon restored but the seed of an idea had been sown and Buñol would never be quite the same again. The following year, the quarrel was re-enacted using fruit that the young people had brought with them from home. Once again, the local police had to break up the fight, a pattern that was repeated for a few years. But this was Spain under the rule of General Franco. His fascist regime, allied to the Catholic Church, permitted only festivals that had a strong religious theme and La Tomatina was banned. 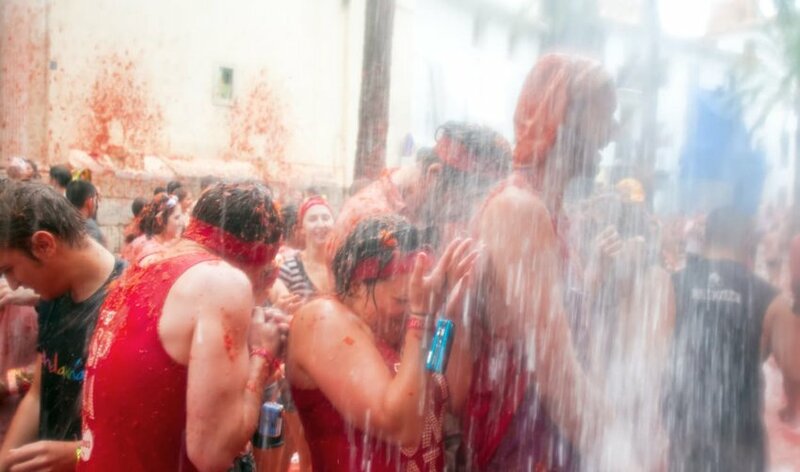 At first, the population of Buñol accepted the government’s decision, but protests about the right to reinstate La Tomatina began to gather support. In 1957, a tomato burial was staged, with residents parading through the streets to the tune of a funeral march carrying a coffin with a huge tomato inside (some say a coffin full to the brim with regular sized tomatoes). Eventually, against the wishes of the more elderly and sedate members of the Buñol community, La Tomatina was reinstated and the fun began once again. Until 1983, it remained a largely local affair. But in that year, a journalist called Javier Basilio, who took a pulpy, juicy hit on behalf of his employer, Televisión Española, covered the festival as part of a segment for the programme “Informe Semanal”. Word was out and the rest of Spain got wind of the fun they were missing. Since then, visitors have poured into tiny Buñol from across Spain and beyond, keen to join in with the action. 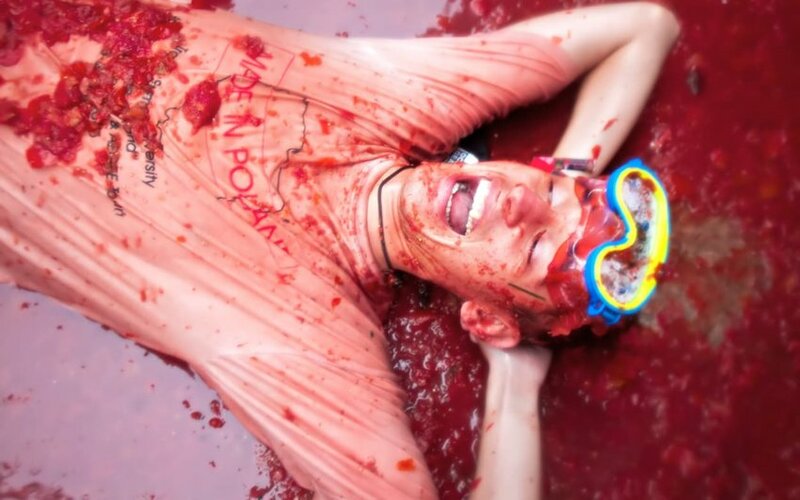 The festival’s success has been officially rewarded too, and Spain’s Department of Tourism declared La Tomatina a festival of international tourist interest in 2002.